Michigan’s Christi Uliczny (RiverValleyDesign) combines pearlex powders, alcohol inks and gold leaf with two different clays to create these shimmering Rocky Path earrings. When I saw that her tutorial detailing the process is available I jumped on it. I’m a klutz with powders and inks and need all the help I can get. Her method is straightforward and clearly explained. I’ll start my week with a lesson. Heather Campbell shows her work step-by-step in a recent post. Starting with two candlesticks, toe shoes and hat boxes, Heather builds an amazing polymer-covered sculpture for Utah Ballet West’s annual “Shoe In”. This small photo doesn’t do the piece justice. It’s the kind of art that’s best appreciated up close. The textiles from her day job in China have crept into French artist Cecilia Botton’s (Mabcrea) newest work. Cecilia’s obviously comfortable with crossing borders and mixing cultures. The caption on this new monochromatic necklace says that she’s using a transfer technique and transfers catch my attention these days. She promises to create a tutorial soon. Her Flickr pages are filled with experiments and exercises. She credits the work and artists who inspire her and lets us watch as she works out her versions. Cecilia also offers a bunch of fun step-by-step visual tutorials which are easy to understand in any language. 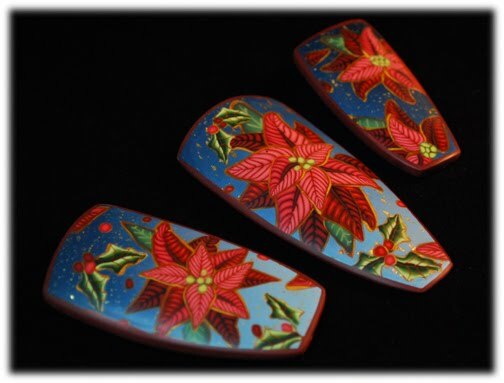 Julie Eakes offers a nifty poinsettia tutorial on her blog. She collages slices from four or five basic canes onto a graduated background for one variation. Then she shows how the same canes can be used for sculptural or dimensional pieces. What a nice gift to readers. Visit the EBay site of “Benefit Ada” which lists polymer clay items from several artists for auction. More than 80 items from around the world were donated. Ponsawan Sila’s daughter will receive the proceeds from this lovely project. Help support the Cerebral Palsy KIDS Center in Louisville, KY by purchasing Ron LeHockey’s polymer clay heart pins. Contact Ron at rlehocky@bellsouth.net. Donate on the site of the Sammunat project. The Australian government has recently provided grant money to this project that assists abused Nepalese women by teaching them beading and business skills. You can help keep this important project moving forward by donating on their site. Thanks to Susan Lomuto at DailyArtMuse and Lindly Haunani for the links. I’m feeling clumsy and in a rush. Polymer clay works that exude a light touch and a delicate sensibility inspire me and calm me down. The bracelet is from Enkhene Tserenbadam from Switzerland. Offsetting the comfortable textured shapes makes them more touchable. The oversized jump rings on her new necklaces add an element of surprise. The glowing hollow translucent bead is from France’s Céline Charuau (GrisBleu). She has a little tutorial on her site that shows you how she assembles beauties like these. Austria’s Eva Ehmeier (Hoedlgut) shows her refined elegant Black Meadow Necklace on her Flickr site. Ok, breathe deeply. Back to the studio.